Here is the second card I did for the Stamp Club Challenge. The mat and patterned strip are scraps I had left over from cutting lollipop holders a t Valentine's day for my friends daughters class. 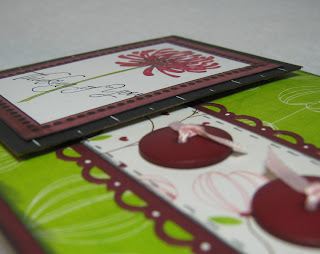 The burgundy cardstock is Stampin Up as is the scalloped border punch. The image mat papers are from the papers we were given *okie wonders if she should tell her bloggies to scroll down so they can see what she is talking about in case they missed it*. You might need to scroll down so you can see what I am talking about if you missed my post about the Stamp Club Challenge. 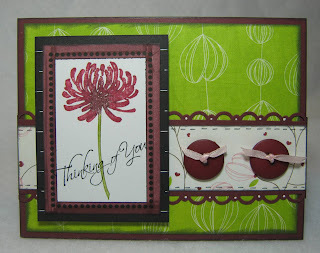 I used one of the journaling blocks and colored the outside edge with a Stampin Up Bravo Burgundy marker. The stamped image and sentiment is from a hostess set I got at my Stampin Up party. I chose to stamp the sentiment directly on the flower image and I think it turned out well. You can click if you want to see it close up. I really wasn't sure how that lime green was going to look, but I really like how it seemed to make the image pop! Here you can see that I pop dotted the stamped image. I did add a piece of chipboard under it because the paper was a little thinner than I cared for and was afraid it would be squishy *okie doesn't think she got enough sleep because she sounds silly to herself*. I tied ribbon through the button. I like using ribbon with buttons if the holes are big enough. If you want to try this just cut your ribbon at a long angle and thread it through. I really love this one, the color & the punches are great! !